This article is about a web browser. For other uses, see Firefox (disambiguation). Firefox usage grew to a peak of 32% at the end of 2009, with version 3.5 overtaking Internet Explorer 7, although not Internet Explorer as a whole. Usage then declined in competition with Google Chrome. 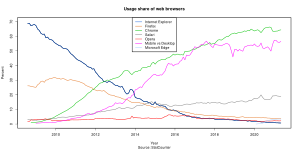 As of March 2019[update], Firefox has 9.57% usage share as a "desktop" browser, according to StatCounter, making it the second-most popular such web browser; usage across all platforms is lower at 4.66% (and then third-most popular overall). Firefox is still the most popular desktop browser in a few countries including Cuba (even most popular overall at 49.7%) and Eritrea with 72.26% and 83.28% of the market share, respectively. According to Mozilla, in December 2014, there were half a billion Firefox users around the world. 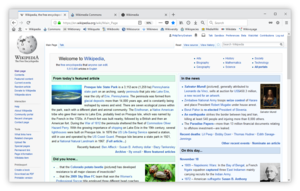 Since version 38 on Windows Vista and newer, Firefox supports the playback of video content protected by HTML5 Encrypted Media Extensions (EME). For security and privacy reasons[which? ], EME is implemented within a wrapper of open source code that allows execution of a proprietary DRM module by Adobe Systems—Adobe Primetime Content Decryption Module (CDM). CDM runs within a "sandbox" environment to limit its access to the system, and provide it a randomized device ID to prevent services from uniquely identifying the device for tracking purposes. The DRM module, once it has been downloaded, is enabled and disabled in the same manner as other plug-ins. Since version 47, "Google's Widevine CDM on Windows and Mac OS X so streaming services like Amazon Video can switch from Silverlight to encrypted HTML5 video" is also supported. As of February 11, 2011[update], Firefox 3.6 had no known unpatched security vulnerabilities according to Secunia. Internet Explorer 8 had five unpatched security vulnerabilities, the worst being rated "Less Critical" by Secunia. Mozilla claims that all patched vulnerabilities of Mozilla products are publicly listed. Since version 60 Firefox includes the option to use DNS over HTTPS (DoH), which causes DNS lookup requests to be sent encrypted over the HTTPS protocol. To use this feature the user must set certain preferences beginning with "network.trr" (Trusted Recursive Resolver) in about:config: if network.trr.mode is 0, DoH is disabled; 1 activates DoH in addition to unencrypted DNS; 2 causes DoH to be used before unencrypted DNS; to use only DoH, the value must be 3. By setting network.trr.uri to the URL http://mozilla.cloudflare-dns.com/dns-query special Cloudflare servers will be activated. Mozilla has a privacy agreement with this server host that restricts their collection of information about incoming DNS requests. Firefox is a widely localized web browser. The first official release in November 2004 was available in 24 different languages and for 28 locales, including British English, American English, European Spanish, Argentine Spanish, and Chinese in Traditional Chinese characters and Simplified Chinese characters. As of April 2019[update], currently supported versions 66.0.3 and 60.6.1esr are available in 89 locales (79 languages). In September 2013, a Metro-style version of Firefox optimized for touchscreen use was introduced on the "Aurora" release channel. However, the project has since been cancelled as of March 2014[update], with Mozilla citing a lack of user adoption of the beta versions. Downloads have continued at an increasing rate since Firefox 1.0 was released on November 9, 2004, and as of 31 July 2009[update] Firefox had already been downloaded over one billion times. This number does not include downloads using software updates or those from third-party websites. They do not represent a user count, as one download may be installed on many machines, one person may download the software multiple times, or the software may be obtained from a third-party. Firefox was the second-most used web browser until November 2011, when Google Chrome surpassed it. According to Mozilla, Firefox has more than 450 million users as of October 2012[update]. As of April 2018[update], Firefox was the second-most widely used desktop browser, and that position makes it the fourth-most popular with approximately 11.78% of worldwide usage share of web browsers across all platforms. ^ "Desktop Browser Market Share Worldwide: March 2019". StatCounter Global Stats. Retrieved April 22, 2019.